Be the first to share your favorite memory, photo or story of Donnie. This memorial page is dedicated for family, friends and future generations to celebrate the life of their loved one. 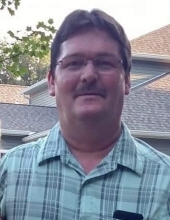 Donnie Craig, 53, of Creal Springs, passed away 4:00 a.m. Monday, September 24, 2018 at his residence surrounded by his loving family. Donnie worked as a factory worker at Harrisburg Glove Factory and for Southern Pride in Marion. Donnie attended Full Gospel Tabernacle in Marion. Donnie was born June 28, 1965 in Marion, IL to Cletis Wayne and Lorene Pearl (Conner) Craig. Donnie was united in marriage with Catherine Heath on June 21, 2015 in Creal Springs, IL. Surviving are, his wife, Cathy Craig; mother and step-father, Lorene and Harry Jackson of Creal Springs; son, Justin Craig of Stonefort; three grandchildren, Ryan Rex, Brylee Rayne, Briar Blaze; step-son, Kalip and Brooke Merrill of Goreville; step-daughter, Tiffiany Merrill of Marion; two step grandchildren, Kylie and Elijah; four brothers and three sisters-in-law, Cecil Craig of Marion, Dennis and Kathy Craig of Creal Springs, Leonard and Linda Craig of Creal Springs, and his twin brother, Ronnie and Lisa Craig of Creal Springs; father-in-law and mother-in-law, Mike and Chris Heath of Huntsville, TX and several nieces, nephew and close friends. He was preceded in death by his father; three brothers, Danny Wayne Craig, Cletis Craig, Jr., Harvey Craig and a sister, Pat Smith. Services will be 1:00 p.m. Thursday, September 27, 2018 with Rev. John Burnett officiating. Visitation will be from 10:00 a.m. until 1:00 p.m. Thursday at Meredith-Waddell Funeral Home in Herrin. Interment will be in Creal Springs Cemetery at Creal Springs. To send flowers or a remembrance gift to the family of Donnie Craig, please visit our Tribute Store. "Email Address" would like to share the life celebration of Donnie Craig. Click on the "link" to go to share a favorite memory or leave a condolence message for the family.